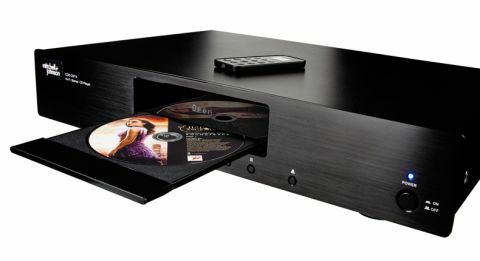 Mitchell and Johnson CDD-201V review | What Hi-Fi? There’s a new kid on the British hi-fi block and its name is Mitchell & Johnson. It’s a company assembled by Paul Mitchell and Dave Johnson, the same duo that brought products from Japanese electronics company Sansui to the UK in 2011. Those products have now been rebranded and re-engineered under the new name, and there are some shiny new ones in its roster too, comprising stereo amps, streamers, DACs, headphones and, here, CD players. The brand has a mission: to make good hi-fi accessible (and by that we mean affordable) to the masses. Of course, Marantz and Cambridge Audio already do this successfully, but as the budget CD player market is hardly swarming with competition, the arrival of the Mitchell & Johnson CDD-201V is welcomed. The CDD-201V is a re-modelled version of the £200 Sansui, to which we gave four stars in 2012. There’s more advanced circuitry under the hood and the faceplate is brushed metal rather than plastic. That may have knocked the price up slightly, but £250 is still a reasonable price for those on tight budgets. Aside from the different branding on the machine and remote, looks are similar. After running our fingers over a sharp corner, we wish a little more care had gone into the casework, but the CDD-201V is sturdily built and generally finished to a good standard. The smart front panel features a readable display and nicely spaced buttons. We like our sample in black, but a silver finish is available too. Design-wise, that’s all we used to expect from budget electronics before Marantz radically upped the standard for aesthetics, finish and build at this price, raising the bar for its competitors in turn. The Mitchell & Johnson looks and feels a tad economical in comparison: its buttons are looser and sound more clicky, while the transport is a little noisy when fed discs. Still, it’s functional, and handily compact if space is an issue. Less appealing is the wafer-thin ‘credit-card’ remote, which is just asking to be lost down the back of the sofa. On the plus side, it works perfectly well and will also operate the company’s matching (and also re-designed) SAP-201V amp. Whatever amp you use, it can connect to the digital- and analogue-friendly CDD-201V through the RCA, optical and coaxial outputs. Connections haven’t changed from the unit’s Sansui days, but even three years on, what you get is around the standard for this sort of money. Insert Eminem’s The Eminem Show album (the player reads standard CDs as well as MP3, CD-R and CD-RW discs) and memories of Sansui’s clean, crisp sound come flooding back. The sonic presentation is well balanced, clear and direct, with no sign of the distortion that often plagues budget components. Add ‘punchy’ and ‘upbeat’ to that and you’ve got an enjoyable sound. It jumps to the album’s catchy tunes and edgy beats: the hard-hitting bassline in Without Me has enough kick, and the track’s playful momentum is delivered with a healthy dose of attack. There’s fair insight into Eminem’s distinctive, tongue-in-cheek vocals, though the Mitchell & Johnson makes no secret of the fact it favours body, clarity and solidity over outright expression. However, it doesn’t quite do justice to a song like Michael Simone’s Any Other Name, which relies heavily on precision and subtlety to carry its intimate piano sequences. Notes are clear and the leading edges crisp, but a lack of dynamic subtlety means they don’t flow together quite as fluently as they should. Having first got wind of Mitchell & Johnson’s arrival at CES 2014, we were keen to get our hands on its goods. In fact, we waited patiently for over a year for a Mitchell & Johnson product to land in our test rooms, so has the wait been worth it? In a nutshell, yes. The CDD-201V might not be good enough to trouble the upper echelons of this class, but it’s a proficient player in a market where talent is sparse.